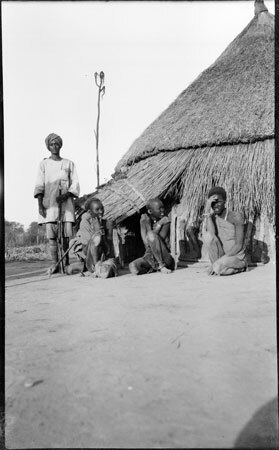 A group of three women (possibly Nuer) with another sitting behind them smoking a long clay-bowl pipe, sitting outside the entrance to a hut, with extended grass eaves that take rainwater away from the walls. Standing behind them is a standing man holding a rifle and wearing a turban and djellaba, probably an Arab auxiliary accompanying Meek on his expedition. Nearby is a shrine-post with small clumps of hair of sacrificed animals attached to it. Morton, Chris. "?Nuer women outside hut" Southern Sudan Project (in development). 03 Jan. 2006. Pitt Rivers Museum. <http://southernsudan.prm.ox.ac.uk/details/1998.204.5.60/>.